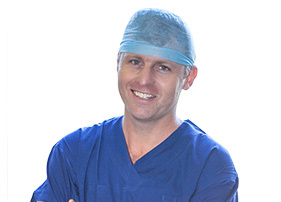 Simon Talbot is one Australia’s foremost users of medial pivot knee replacements. He has performed more than 400 of these replacements over the last 3 years. He participated in both the recent multi-centre trial of the Saiph medial pivot knee replacement, and a study comparing the stability and outcomes of medial pivot knee replacements to other designs. Medial pivot knee replacements attempt to recreate the biomechanics of the normal knee with fully congruent components on one half of the knee joint. The result is to improve the stability of the joint, while maintaining knee flexibility, with the aim of improving patient satisfaction. 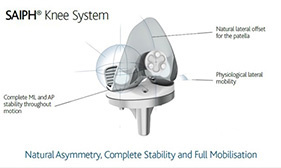 The medial pivot concept has been prominent in the United Kingdom for more than 20 years with excellent results. The new generation components, such as the Saiph knee, have been used in Australia for more than 5 years. The results so far have been very good with excellent results in the Australian Joint Registry and excellent reported patient outcomes in several studies including a 95% patient satisfaction in the multi-centre trial. The results of these trials and registry results are detailed in the summary of clinical data and patient information sheets.